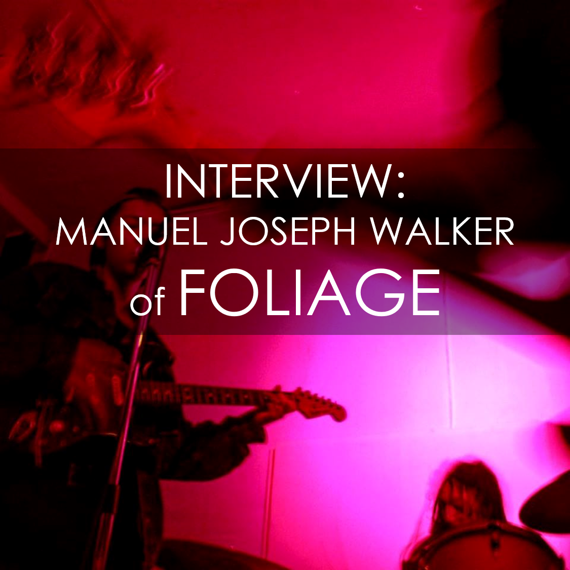 INTERVIEW: Manuel Joseph Walker of FOLIAGE. Foliage is a California-based 4-piece consisting of Manuel Joseph Walker (vocals and guitar), Anthony Walker (bass guitar), Alex Lara (guitar), and Ethan Rodriguez (drums). The band’s sophomore LP, Silence, was just released on July 20th via Spirit Goth. Lovers of nostalgic jangle pop – take note. Foliage has nailed this sound, embracing the classic elements while also contributing fresh tones and nuances. We first became aware of the band after the release of debut LP Truths in 2015. The songs were well-crafted and intelligent, and the lo-fi janglepop sound was easy to love. Little did we know, Manuel was only 16 years old at the time, making the debut even more impressive. On Silence, the newly released sophomore offering, Foliage has honed their signature sound, with each aspect of their songcraft sparkling just a little more brightly than before. The approach to production is more incisive, and there’s a new maturity, clarity and depth to their sound. We highly recommend that you check out Silence, and we hope you enjoy getting to know more about Manuel through the following interview. When I was 16, I put out a song called “The Things I Do for Love”. A few friends of mine really liked the song, so I decided to write an album. I hit up my homie Alex about playing guitar in the band if Foliage were to ever become something. We got the band together and played a series of shows throughout 2015, following the release of Truths, the debut album from Foliage. The band has gone through quite a few lineup changes, but Alex Lara has remained the guitar player in Foliage. I like to handle the songwriting and the recording/production standpoint of Foliage, but the band consists of Anthony Walker on bass guitar, Alex Lara on guitar, Ethan Rodriguez on drums, and myself on vocals and guitar. Your sophomore LP, Silence, just came out. I love it! How do you think it compares to your first album (which I also adored)? Did you use any new recording techniques or approaches in general this time around? Thank you very much, glad you're enjoying it. I'm also glad you loved Truths, as well. I think Silence is definitely a better record. Truths is more or less just the average dream pop record, full of melancholy songs longing for love. It's a great debut, but it's nothing very special or unique in anyway in my opinion. Silence is a much different and more mature record. I feel as if Foliage has made a name for itself with not only the songwriting, but the distinct sound and production on the new record. I went for a cleaner sound with Silence; I wanted people to hear the lyrics and feel all of the instruments, without a wash of reverb, while still remaining as ethereal as possible, if not moreso. Starts in 1 hour!! Brilliant sounds provided by Paper Daggers, Mermaidens, Peppermint Showers, See Through Dresses, Foliage, Bleach Dream, She Sir, Panda Riot, Magic Shoppe, M!R!M, Moon Loves Honey, Retrieval + MORE! Stay tuned in after WTSH for Somewherecold at 12am EST/9pm PST! 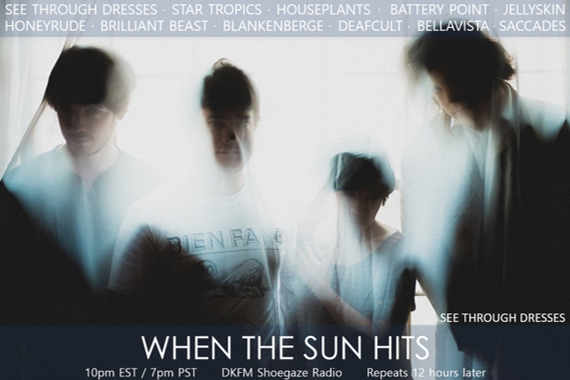 When The Sun Hits airs on DKFM Shoegaze Radio! Aiming to dazzle (and possibly deafen) you. GOALS! Stay tuned in to DKFM after WTSH to catch MUSO ASIA! INTERVIEW: Evan Raab of Dulls. Philadelphia quartet Dulls consists of Evan Raab and Erica Carter on voices and guitars with Kirk Bray on bass and Jack Pfeifer on drums. The project has so far released two EPs digitally and on cassette. The four-track self-titled debut came out in January of 2016; the three-track Moon Violet EP saw release in February of this year. The first three tracks of the self-titled debut EP are an excursion in what might best be described as dark, eclectic heavy psych. Shades of punk, metal, and doom are all brought into play and rendered with delightfully liberal layerings of fuzz. The outstanding five minute closer, "Whole", brings the band closer to shoegaze and dream pop territory, a positioning retained throughout Moon Violet. While John Cep of The Stargazer Lilies served as recordist on this second outing, which, as mentioned, shifts onto ground somewhat different from most of the first effort, there’s still an unmistakable consistency across all the material the band has so far released. Erica’s vocal delivery and Evan’s singing lead guitar tones, both distinctive, contribute to the strong identity the band has right out of the gate. The performances and recording have a slightly rough-around-the-edges feel that perfectly suits the sense of freshness and present-tense vitality pervading both releases. 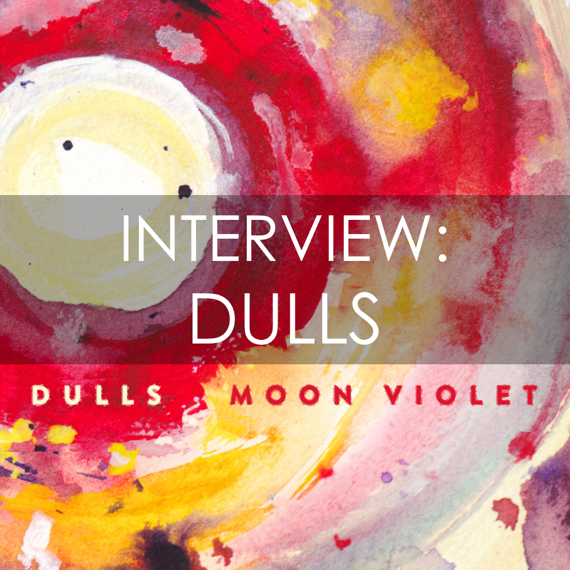 Dulls has been one of our most exciting discoveries of 2017 thus far, so we were delighted when Evan agreed to take time out for the interview that follows. We’re very grateful to Yana Komeshko of the outstanding Russian shoegaze project Aerofall for bringing Dulls to our attention by posting a track on the Aerofall and Friends Facebook group this past March. Dulls will next be appearing on July 19th at The Silent Barn in Brooklyn, New York. Jack and I played together in a band in college. After graduating we pursued separate projects but started playing together again casually in 2013. After going through some lineup changes, Kirk came on board to play bass. Erica joined in early 2015 and the band played our first show as Dulls that March. We are working on a new setlist which we hope to release material from as a 7-inch. We’ve been playing outside of Philadelphia more lately and are currently working on getting a proper tour together. How do you feel about genres? Defining one's sound by genre can be tiresome, but do you feel that the band identifies closely with any genre? Do you consider your music to be part of the current shoegaze/dream pop scene? Our music definitely has elements of that, and all of us really like that stuff. But as far as executing our own music, we tend to rely on our personal leanings. Jack is very much into R&B and more beat-oriented drums, and Erica has an adoration for classic Sixties-style pop, which I think gives us a unique identity in the scene. I feel that most shoegaze bands tend to lack poppy hooks and leads, which I try to throw in where I can. It’s a pretty vibrant scene these days. I feel like almost any band with a cranked-up reverb pedal that throws on some occasional feedback gets the word “gaze” thrown into their description, which I think is a little bit silly. It’s amazing how this style of music has had the revival it has, but what I think is really great is that artists are taking elements from that style and incorporating it into their own musical blend. 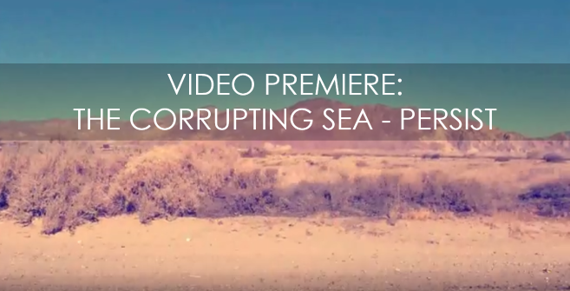 VIDEO PREMIERE: The Corrupting Sea | Persist. We’re excited to premiere the new video for “Persist” by ambient/experimental/drone artist Jason Lamoreaux, who records under the project name The Corrupting Sea. The video, which was written, directed and edited by Paul Lewis, features slowly morphing landscapes that seem innocuous upon first glance, but as each scene progresses, an unsettling and undeniably sinister feeling descends. When set to the otherworldly sounds of “Persist”, the video becomes a full-on sensory experience. "Persist" is from the album Resist, which comes out on July 14 via Somewherecold Records. It will be available digitally and via limited cassette. TONIGHT! 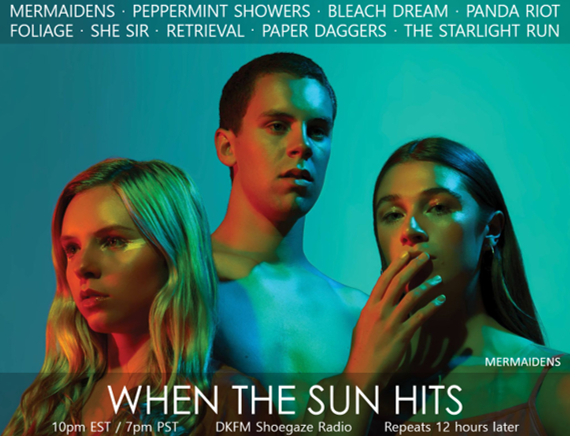 WTSH on DKFM + Premiere of The Daysleepers' brand new track! 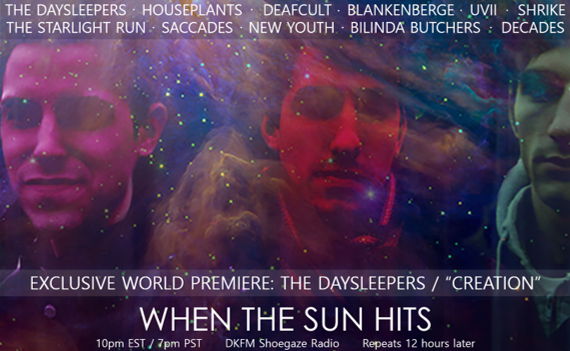 WTSH airs on DKFM with an exclusive premiere of the brand new track by The Daysleepers. Are you pumped? We're so pumped for this! 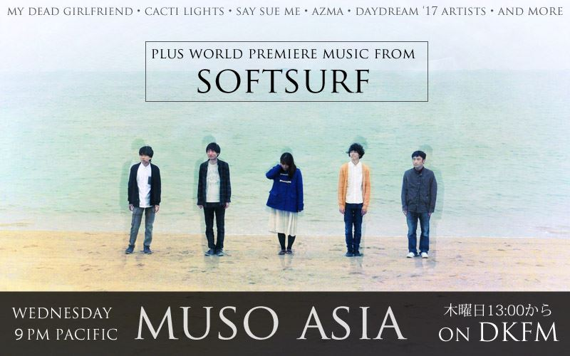 Catch a new episode of Muso Asia after WTSH! Catch the replay of both shows 12 hours later. 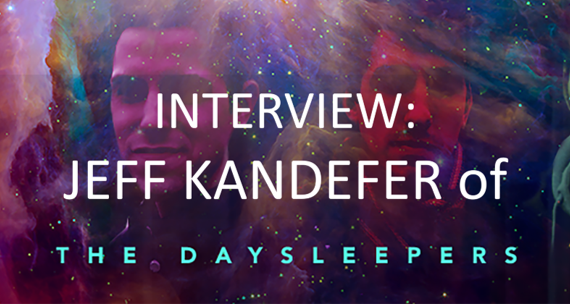 INTERVIEW: Jeff Kandefer of The Daysleepers. New track premieres TONIGHT on WTSH! It’s no secret that we here at WTSH are massive fans of Buffalo-based trio The Daysleepers. When Jeff contacted us recently about premiering their brand new single, we were absolutely over the moon. Once we actually heard the single, which is entitled “Creation”, we were even more thrilled – it’s a beautiful, deeply atmospheric piece that both lives up to and exceeds our high expectations of this group. The single premieres tonight on the When The Sun Hits radio show, which airs on DKFM at 10pm EST/9pm CST. 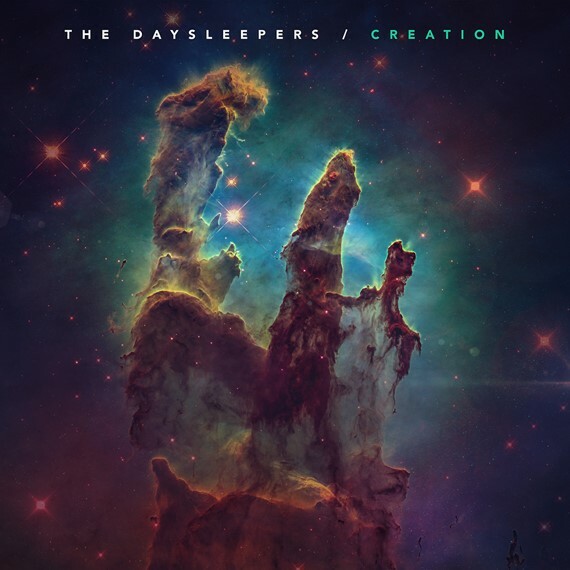 Tune in live to be among the first humans on Earth to hear this glorious new tune from The Daysleepers. It won’t be available for streaming or purchase until tomorrow via Bandcamp, so don’t miss this exclusive airing! To tide you over until then, we recently spoke to Jeff about the new single, among other things, and you can read that interview below. Aside from the Smiths cover released a few months ago, the Daysleepers have been pretty quiet in recent years. What has everyone been up to? Did something prompt the recent activity? Our lives, like a lot of people, are very busy and all of us have responsibilities that take priority over this project – but when we do make music, we don't like to force it. It has to feel right and organic. Our last full album, Drowned in a Sea of Sound, was a lot of work and took a lot out of us at the time. I think when it was finished we all just sort of wanted a break from it to focus on big changes in all of our lives. During that period, we did still get together and work on music from time to time but it wasn't really that organized. Because of it, nothing really got done until 2014 when we released "Dream Within a Dreamworld". That song was received well by our fans and it gave us some momentum to start thinking about new material. In mid-2016, I had an idea to revisit an older concept we had years back for an album called Creation. I had an idea of what I wanted the guitars to sound like, so I sold a bunch of my old pedals and equipment and researched new gear that would give me a bigger, more atmospheric sound. I found what I was looking for. Those new sounds made me overflow with new ideas and I started writing new material. Mario & Scott seemed very excited about some demos I had thrown together, so we started right back at it again. Also, new releases over the last few years by My Bloody Valentine, Swervedriver, Ride and of course Slowdive were very inspiring to me. It's a great time for this genre and we want to be a part of it again. Style-wise, how does the new single fit in with the rest of the Daysleepers output? Are there any significant changes or new approaches to your sound? We all feel this new material is the next level for sure. You'll definitely hear our style in it, but overall it sounds bigger to me. More emotional and more mature even. We are producing this album as a band, so that will be a bit different as well. With the past material, we would head into the studio for a few weekends and walk out with finished songs. That worked well back then and it was efficient, but that method didn't leave much time for experimentation with sound. Now, with our own studio, we can spend as much time as we need to perfect the sound we're going for. That's also a double-edged sword, because songs can take too long to finish. For example, we were recording/mixing this new single for about 3 months until we perfected it. I hope to speed that process up significantly with the rest of the album. In the end though, these songs are exactly where we want them to be. What can you tell us about the forthcoming release? Have you finished recording it? Is there a release date yet? So, we have the new single finished, and 2 other tracks pretty far along. I also have a few early demos for a couple others, so we're still in the writing/recording phase. My plan is to have it out by spring 2018, if all goes smoothly, but we'll be releasing singles right up until the album is released. You'll probably have heard most of the album before it actually comes out. I'm not a fan of overly long albums, so it will most likely be around 8-10 tracks. One of the many things that I love about my favorite album, Disintegration by The Cure, is the variety of different kinds of songs on it...yet it all feels like a solid complete thought. On that album you have fast songs, slow songs, pop songs, long ambient songs, happy songs and sad songs. Such a good mix! The problem with some shoegaze albums, I find, is that they can sometimes sound like one long song. Sometimes that works, but we're trying to mix this one up with a variety of different types of songs that all sound like they're a part of the same family. Are you still writing and recording with the same band lineup? Yes, the band is all the same. The biggest change is that the producer of our previous material, Doug White (Makaras Pen, Tearwave) will not be producing this one. It'll be produced exclusively by The Daysleepers at our own studio. We wanted to see what an album would sound like with us 100% at the controls. Where can everyone buy the new single? We're trying something different with this one. The day after it premieres here on When The Sun Hits, it'll be available for download only through our Bandcamp website. Then, about a week or two later all the big vendors like iTunes, Amazon, Spotify, Apple Music and so on will have it available as usual. We really love Bandcamp. The control you have in releasing music with them is so great for independent artists, not to mention the fact that people can download high res files of both the song and cover art. It's a great platform. SUMMER TOUR DATES: The Stargazer Lilies.